Uploaded 10 марта 2016 г.
VALORACIÓ GLOBAL : Etapa 16 del GR 92 feta , per temes de logística,en sentit N surtin del Coll de Font de Cera fins el de Bordoi. L’hem qualificat de moderada pel tema d’orientació en especial des de la urbanització Sant Carles ( wpt 07) . De fet, quasi no trobem cap pintura fins la Torrassa ( wpt 08 ) Caminem molta estona per boscos d’alzines i alts pins. DESCRIPCIÓ : Com sempre, els wpt pretenen indicar els punt més significatius, interessants i conflictius de la caminada. Boniques vistes del Montseny ( la Torrassa wpt 08 ) i del Barcelonès a prop del Coll de Cera ( wpt 01) . TIPUS DE CAMÍ : Com és lògic per la distància hi ha bastant de pista alternant amb bonics trams de corriol. Es nota el pas de motos en algunes “trialeres” molt desfetes. Paisatge típic de la zona. POSSIBLES VARIANTS : Hem fet alguna curta drecera, sempre molt evident. MENJAR : Hem dinat a Vilanova del Vallès. Restaurant Can Martinet ( 938 459117 ). Molt bon tracte amb menú ( 11,50 feiners) més que correcte. Diuen que una imatge val més que cent paraules, per això pujo part de les fotos que faig a cada sortida. Donen una primera impressió dels llocs. Un cop més, no em cansaré de demanar l’apartat de “muntanya” dins el wiki. Està molt clar el que és alpinisme i ferrada, però al menys per a mi, el terme “senderisme” és massa ample i fa difícil la valoració de la dificultat tècnica i Física. TL;DR Would skip last bit to Llinars (if not trying to walk the whole GR-92). Would take alternative route for the stretch that goes through waypoints 02 - 021. Giving it five stars on account of the awesome work by the OP documenting the trail --we would have gotten lost a bunch of times without it! The trail itself probably doesn't deserve as high a score. (1) We didn't enjoy the stretch from Llinars to the start (/end) of the Serralada de Marina reserve, no nice views or forests there. Would definitely skip it if possible and if you're not trying to complete the whole GR (if the resulting trek feels too short you can always make it longer on the Alella/Montgat side, maybe walk all the way to the Montgat Nord train station). Also, the walk from the Llinars train station to the origin (/endpoint) of the trail was a bit long and slightly dangerous (curb too narrow at times, had to walk on the road). (2) We were following the GR-92 signage inside the park and ended up taking an alternative path to the stretch that goes through waypoints 02 and 021 (the path just south of it on the map). 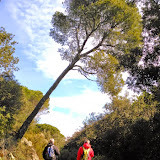 It ended up being hands down our favorite bit of the trek, with nice views of the Maresme coast and Barcelona, and a scenic viewpoint that made a perfect spot for a short pause. Can't speak for the stretch we didn't walk but I would consider making this small tweak. (3) Most of the trail goes indeed through pine / alzina woods, but the path was wide enough that the trees didn't afford much shade, so I guess plan accordingly in terms of water/sunscreen.